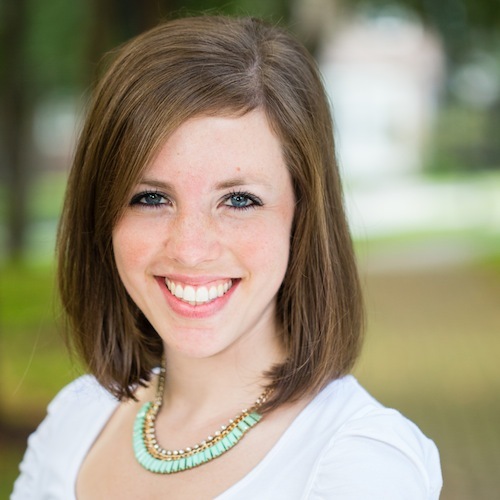 Having a newborn has made me really appreciate time. Time to bake, time to exercise, time to chill, time to eat…yeah, I don’t get much for any of those any more. Lucky for me, popsicles have been a fun little way to get in the kitchen just for a few minutes and practice my rapid photography skills. You know, when you have a baby, you have to be really quick to grab a camera and capture a moment. It’ll be gone before you can blink an eye! Popsicles are the same basic premise, except you can control when you take them out of the freezer. Once they’re out, you have a very limited window to take a few quick shots before they start to get that white icy hue and then start melting all over everything, all while there’s a screaming baby in the background longing for some entertainment by your’s truly! It’s quick, and quick is good for me right now. I guess that’s why its better that young people have babies. All those fast twitch muscle fibers that young olympians have. Yeah, I don’t know why I’m comparing myself to an olympian…maybe an olympian of chocolate eating? Or the amount of baby puke I have on me? Go make popsicles. Then eat them. Oh, and I’m pretty sure this is my new favorite way to get my fruit. Blend it and freeze it! 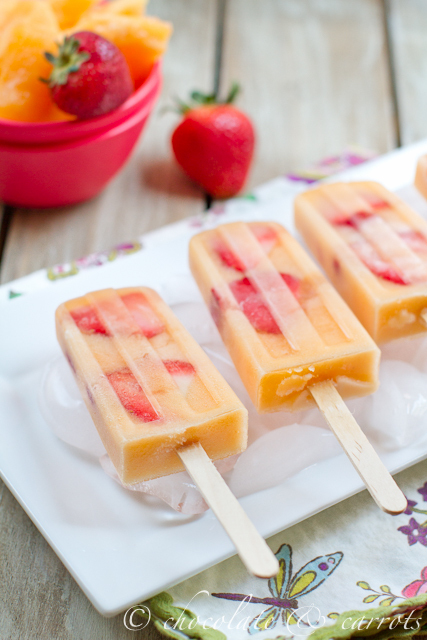 Add a few pieces of sliced strawberries to your popsicle mold. 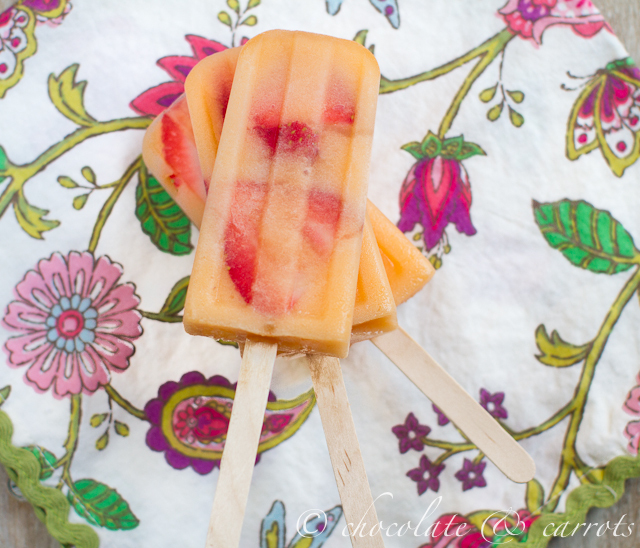 Pour the liquid cantaloupe into the popsicle mold. Time to eat? Whats that? 😉 I think my whole way of eating has gone out the window. I love those suggestions that you always sit down and eat a meal uninterrupted. That does not exist for new Moms! The popsicles are beautiful. I am a cantaloupe addict (they’re on sale this week buy 1 get 1 at teeter and I’m definitely hitting that up). Yum yum! And I SO know what you mean…I’m trying to mentally prepare myself. It’s been so long since Jon David was small, I can barely remember how I got everything done. 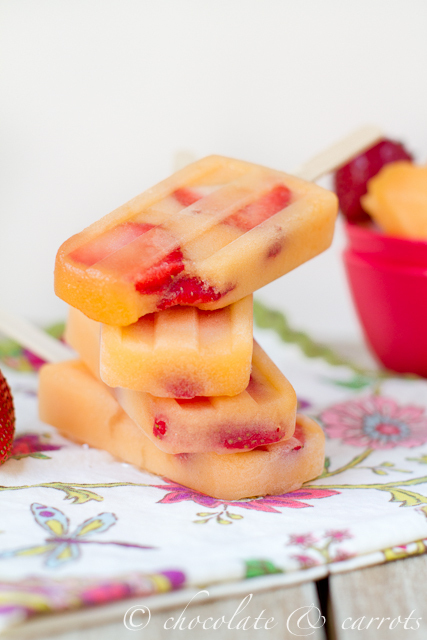 You’re getting really, really creative with the popsicles! Love that there’s no added sugar. Looks like you got some gorgeous photos despite having to rush! Love that these are so simple but come out so pretty. I love all these popsicles you are making! They are amazing ! Gorgeous!! I seriously need to get on the popsicle wagon next year. I adore these! Cantaloupe is one of those fruits that my kids devour!! What a fun way to eat your fruit and I love that it has no added sugar. 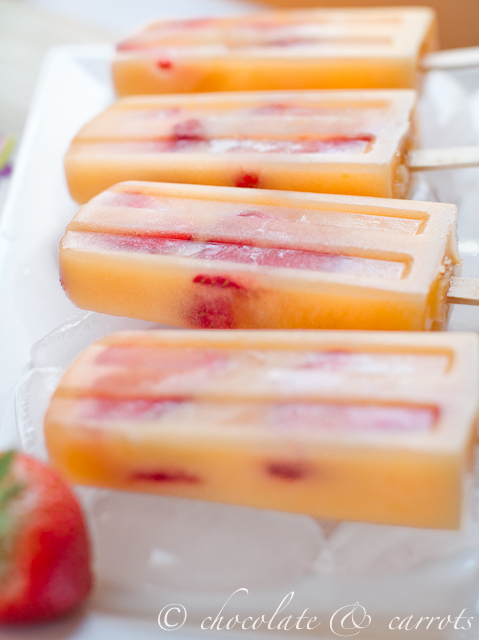 Pingback: Summertime Popsicle Recipes - Cool Off Your Hot Days!